Keep Your Head Down and Your Helmet On! My friend Brat wrote this article and it’s one that needs to be spread far and wide. Please read the article, and do what you can to help. Many of us in the troop support arena often tell our own troops that saying. Head down and helmet on seems to make perfect sense both for our heroes, and for those of us who love them. Now there is news that keeping your helmet on may be causing more than a BIG headache. Dr. Robert Meaders is a retired Captain in the US Navy, Medical Corps. Retired he may be, but Dr. Meaders is far from enjoying a relaxing retirement; he is a man with a mission. Operation Helmet is Dr. Meader’s ongoing effort to support our troops. The ongoing mandate of Operation Helmet is to replace the government issued (GI) helmet liners that our troops wear. The current helmet liners supplied to our troops are the product of Team Wendy. If you go to Operation Helmet’s site, you will see letter after letter from troops stating the problems every helmet liner causes. Let’s be clear here. Dr. Meaders is NOT badmouthing Team Wendy, or lambasting the government or military. On the site, Dr. Meaders acknowledges that the helmets themselves are tested to rigorous standards, but that the liners themselves do not appear to meet certain obvious criteria. The wearers of the GI issued helmet liners tell of the headaches they get from these liners, to the point they can only be worn for about 30 minutes with no adverse effects. This past week, I got wind of the possibility that Government Issue (GI) pads might be extremely flammable. Being a suspicious old doctor, I tested for myself one each of the GI pads and the Oregon Aero pads we have been providing for the past four+ years. I lit a kitchen match, holding it just under each pad so the flame made contact. The GI pads manufactured by Team Wendy and the other approved pads except those of Oregon Aero burst into a flaming inferno producing a stream of burning plastic dripping from the pad. The Oregon Aero pad flamed momentarily then self-extinguished. Dr. Meaders set out to do something about this need of our troops. His goal is to replace every military issue helmet liner with another liner that negates all previous problems documented with the Team Wendy liner. Already he has sent out over 39,000 replacement helmet liners manufactured by Oregon Aero. Operation Helmet has testimonials of gratitude from our fighting troops who have received the replacement liners. Obviously, this is an urgent need. In a war zone, where Traumatic brain Injuries (TBI) are an ongoing danger, it is imperative that a) troops keep their helmets ON, and b) that these helmets are inflammable. A helmet too uncomfortable to wear for long periods when out on a mission, is a disaster waiting to happen for our warriors. 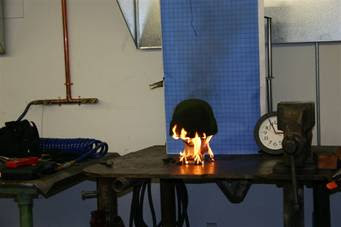 When an IED explodes our heroes need to be WEARING their helmets, and those helmets must be inflammable. Dr. Meaders’ organisation is a registered non profit group, and they are always in desperate need of funds. They send these helmet liners to our troops FREE of charge. As with most efforts of supporting our troops, as word is spreading among our troops, so the requests keep rolling in to Operation Helmet in ever-increasing numbers. Right now is the perfect time to make sure that our troops CAN “keep your helmet ON!” Let’s get ‘er done. Ros Prynn is a NewsBlaze investigative reporter and editor, who writes on a range of topics. Contact her by writing to NewsBlaze. Filed under: Brat, Miss Beth, Operation Helmet |	Comments Off on Keep Your Head Down and Your Helmet On!